Save Marinwood-Lucas Valley - our community, our future: Study: Portland traffic ranked 10th-worst in U.S. SMART GROWTH DOESN'T REDUCE TRAFFIC! 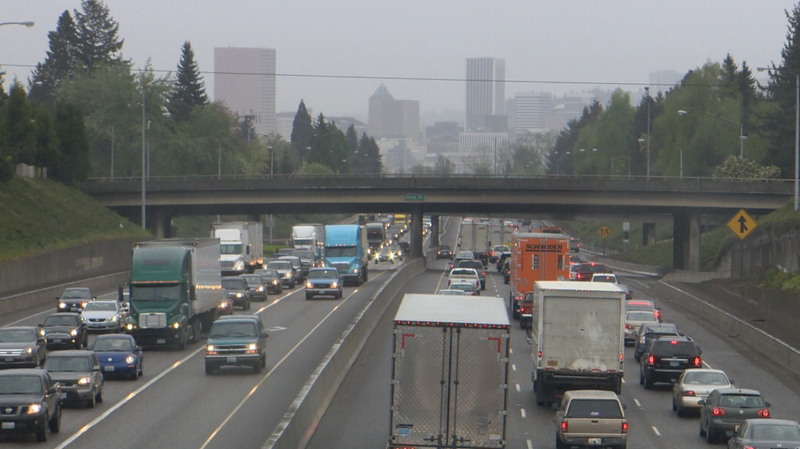 Study: Portland traffic ranked 10th-worst in U.S. SMART GROWTH DOESN'T REDUCE TRAFFIC! Study: Portland traffic ranked 10th-worst in U.S.
Portland drivers who spent 30 minutes commuting in 2013 saw that bump up to 50 minutes, on average, in '14, the study said. PORTLAND, Ore. – Portland has the 10th worst traffic in the United States, according to a study conducted annually by the TomTom Traffic Index. However, Oregon Department of Transportation spokesman Don Hamilton disputed that ranking, questioning the methodology that Tom Tom used to generate their statistics. "I don't think anybody would really consider us to be worst off than Washington, D.C. or Boston, or some of those cities with famously bad traffic," Hamilton said, explaining that he thought the research was skewed because Portland is such a "compact" city with shorter commutes, in terms of distance traveled. The TomTom index did in fact rank D.C. as # 9, but only 1-percent worse than Portland. Boston was ranked as # 16, just above San Deigo. OregonLive traffic reporter Joseph Rose also criticized the data. "The self-professed 'world's most accurate barometer of traffic congestion in 200 cities across 6 continents' says Portland traffic is worse than Houston (ranked # 12) and Boston," he criticized. "The [TomTom] rankings are based on an overly simplistic formula." TomTom is a global supplier of in-car location and navigation (GPS) products and services. It's annual index is typically used as a tool for city planners evaluating areas in need of upgrades or changes to improve traffic flow. Its latest index zeroed in on increased traffic patterns during evening rush hour, which was the most congested time of day for all of the cities studied. Los Angeles, Calif. was ranked as the worst overall, followed by San Francisco and then Honolulu. According to the data, traffic congestion has increased 4 percent in Portland, comparedto the previous year, when it was ranked No. 9. It may come as no surprise that Seattle traffic is even worst than Portland, according to the study. It has the 5th-worst traffic in the U.S. - but that was an improvement from its No. 4 ranking the previous year. "In addition to recognizing the impact of rush hour traffic, the TomTom Traffic Index can help road authorities measure the performance of their network and pinpoint areas where traffic flow can be improved," said Jocelyn Vigreux, President of TomTom USA. The study also calculated how many hours drivers lose on the road during peak periods, due to traffic congestion. Portland drivers who spent 30 minutes commuting in 2013 saw that bump up to 50 minutes, on average, in 2014, according to TomTom. That calculates to 77 hours lost behind the wheel over the whole year. For those who have a choice in when to take to the road, TomTom looked at how its research could provide some relief for drivers. For example, it determined that the best days and times to commute in Portland tend to be Friday morning and Monday evening. If at all possible, avoid Thursday mornings and Thursday nights, because those proved to be the worst commutes of all.